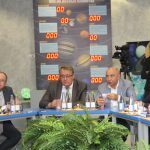 The talks also included Rector Ilshat Gafurov, Vice-Rector for Education Dmitry Tayursky, Head of SAU AstroChallenge Oleg Sherstyukov, Director of the Institute of Physics Sergey Nikitin, and Director of KFU Engelhardt Observatory Yury Nefedyev. They were dedicated to discussing the ongoing cooperation between the parties as per the agreement signed three years ago. Mr. Savelyev showed special interest in innovations which have already been implemented in the industry. KAMAZ, a local automotive giant, plans to reorganize its production for the upcoming driverless truck (KFU Department of Radio Physics is in charge of this work). 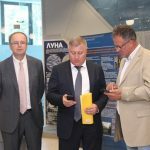 A virtual polygon for navigation and communication system tests for robotized KAMAZ vehicles has been already launched. Another example is a new cryptographic system capable of arranging absolutely safe mobile communication lines. The system relies on physical encoding processes. Popularization of science was also touched on. KFU is active in spreading knowledge among different age groups, especially youngsters. 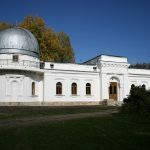 About 2 thousand schoolchildren visited the Engelhardt Observatory and KFU Planetarium in 2016. Mr. Savelyev promised to assist in bringing a space capsule to the Observatory’s exhibition. A school astronomy club called Lira (Lyre) was established at KFU over 20 years ago, and annual summer schools in astronomy are held. Furthermore, an astronomy textbook for high schools is in the works (the subject will return in the compulsory curriculum for senior classes this coming academic year). A part of a new multimedia learning material in geography will also be introduced to high schoolers soon. Roscosmos was invited to partake in creating full-dome educational films for the Planetarium. The sides agreed to hold further negotiations and to create a collaboration roadmap. One of the breakthrough projects in the plans is a nanosatellite (CubeSat) network. The network can then be used by KFU to search for axions, hypothetical components of the cold dark matter. Deputy Savelyev opined after the meeting, “Kazan Federal University has huge potential! I think that Roscosmos has to take a new outlook on cooperation with KFU. We have to make a delegation and come here once again”.